Home Hockey	It’s Blues Hockey Eve! That’s what Blues GM Doug Armstrong was told this off-season when talking to the ownership group during the O’Reilly trade talks with Buffalo. When Dave Checketts or the Lauries were at the helm, that would’ve never been an utterance to the GM. You would have to go back to at least the Shanahan era to see an ownership group with that much financial moxie. Bringing in Ryan O’Reilly, Tyler Bozak, and Pat Maroon, plus bringing back David Perron, has brought the Blues a lot of what they lacked last season. Depth at center, secondary scoring depth, and forward size have all seen a boastful upswing this off-season. There is only one issue that I see with this team, the elephant in the room so to speak. Will Jake Allen suffer yet another January collapse? If he plays consistently all season we’re looking at a serious cup contender team. Cross your fingers St. Louis. Now, we’re two days away from puck drop on the regular season, and I think I speak for every St. Louis hockey fan, Blues fans are HYPED! And with good reasons. First, most Blues fans have known about the A-list prospects, Robert Thomas and Jordan Kyrou, since at least last season. Then, the Blues organization had a monster off-season with the O’Reilly trade and the free agency signings. Then, it was announced that the Urge created a new goal song, which will immediately follow the classic, organ “When the Blues Go Marching In”. Finally, finally indeed, the opening night roster was announced on Tuesday afternoon. That roster has a few caveats: Robert Bortuzzo has one game left in his suspension that he received in the preseason for elbowing Capitals, Michal Kempny, and Joel Edmundson is unlikely to play tomorrow with a groin injury. The second, third, and fourth line right wingers are arguably interchangeable, as well as the third and fourth line centers. Honestly, Robert Thomas controls his own destiny as to what line he centers as the season chugs along. Although, I don’t see him taking O’Reilly’s spot. Jay Bouwmeester will likely only stay on the top line for as long as Edmundson is injured. Upon Edmundson’s return I would like to see Dunn stay on the second pairing and Bouwmeester pair up on the third with Schmaltz or Bortuzzo. Dunn was a stud last season and will likely continue to improve his game, but I don’t see Dunn on the top pairing in his sophomore season. Barring any more back spasms, Jake Allen, backed up by Chad Johnson. 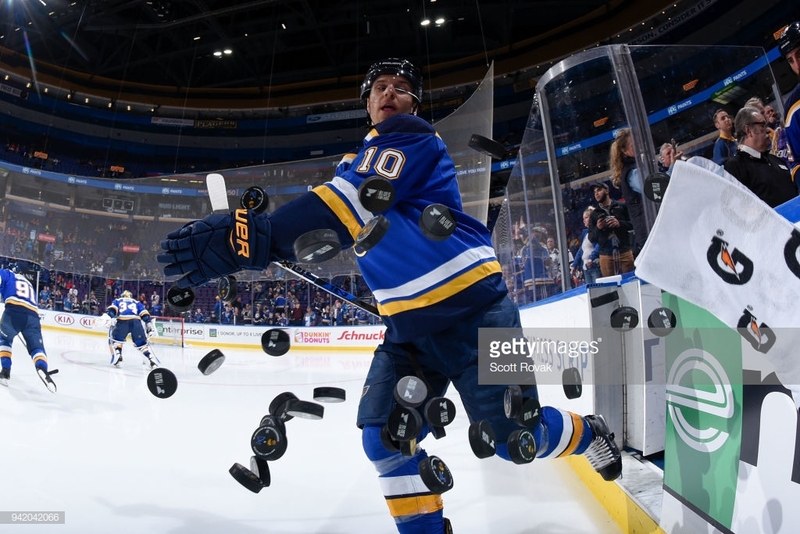 The Blues only true option at enforcer was sent down to the AHL this week, and the options for the third and fourth lines don’t look like classic, ‘hit ‘em in the mouth’ Blues style hockey. I know a lot of fans won’t take kindly to this new look. Personally, I’m a bit skeptical, but the game is changing, and the enforcer is an ever-rare breed now a days. You’d be hard pressed to find anyone in today’s league that can even hold water to Ryan Reaves. He might be the last of his kind in the NHL, and he deserves it too! He drastically improved his game to be a true fourth line grinder that can throw the mitts still if need be (if anyone even dares to drop the gloves). So yes, the Blues are, by all of what it looks like on paper, going to play a style that is semi new to the salary cap era NHL. That style is rolling four lines, with a ton of speed on the roster. The size is still where it needs to be and there is going to be one defenseman per pairing that can staple gun the opposition to the boards. However, this team is nicely balanced with a lot of talent on each line. This team will be fun to watch, and relentless on attack if the new guys buy into Mike Yeo’s play style. I don’t see any reason why they wouldn’t. You know what teams have recently rolled four lines? The Penguins and the Blackhawks. Those two teams have combined for four Stanley Cups in the past six years.